As a child growing up in SOS Children’s Village Kavre in Nepal, Rupesh Lama would mesmerize the other children by acting out fantastic stories. He would have his SOS family laughing hysterically with his jokes and character impressions. 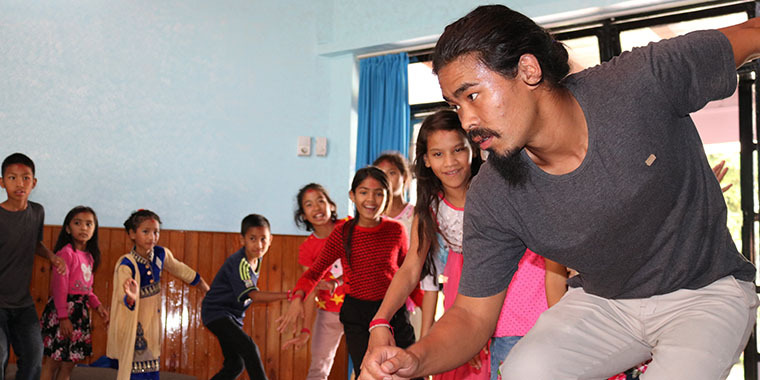 Now as an adult, Rupesh has turned that early talent into an acting career, performing with a theatre company in Kathmandu. His dream, however, is to one day go into movies and be the first Nepalese actor to win one of acting’s highest honors. For those who have seen Rupesh perform, like his youth counselor Binod Mani Bhattarai, it is a dream that could very well come true. In 2017, Binod saw Rupesh perform at his theater company’s performance of Hariyo Dhunga, or Green Stone, a play about a Bhutani refugee. Rupesh came to the SOS Children’s Village in Kavre as a young boy not long after his father died. His mother remarried and abandoned him and his two other siblings for reasons he still does not quite understand. He and a younger sister came to the Village. Growing up Rupesh was the character in the family. He loved to crack jokes and kept his friend’s entertained by coming up with plays and assigning them different roles. He used to tell people that he was a born actor. While many young people who grew up in an SOS Children’s Village are grateful for the education they received, for Rupesh - who studied English Literature at Tribhuvan University in Kathmandu - it is more than that. What motivated him to become actor is that he loves the feeling of immersing himself in a character. “We have to live that character. When we do that, we as actors can feel many things and that’s the main thing I love,” he explains. To support Rupesh in developing his acting skills, Binod – the youth coordinator – contacted someone in the theater he happened to know personally. Sunil Pokhrel is a well-known Nepali theatre artist and director who accepted Rupesh in his acting school in 2016. Six months later, Rupesh joined the Gya-Discover Yourself theatre group and has been performing with them ever since. On occasion, Rupesh visits the children at SOS Children’s Villages, sometimes conducting an acting class. On one visit, he had the children pretend they were feathers, moving gracefully through the air.